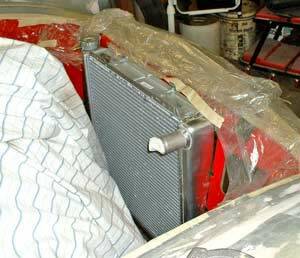 1955 T-Bird Project — Part 13 — Where, Oh Where Does The Radiator Go? Here's the deal. When you change out the entire front frame to accommodate a rack-and-pinion steering system, clearances for other items are going to be affected. This is certainly true for the T-Bird's original radiator and made even more complicated by the fact that we are using a new, modern aluminum radiator that doesn't fit the original bracket in any way. On top of that, we had to accommodate an air conditioner condensor and a transmission oil cooler, both necessary items and both requiring substantial real estate. 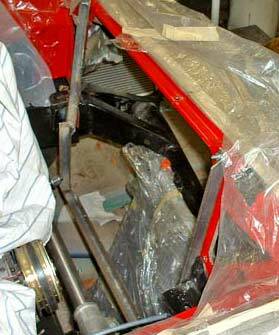 Getting started, however, we found a quick test-fit of the radiator against the inside of the front valence demonstrated that the original bracket wouldn't work. 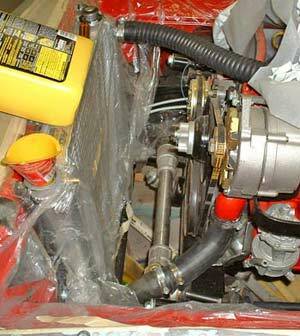 It caused the bottom of the radiator and its hose connection to interfere with the steering rack, necessitating that the bottom be angled toward the front of the car several inches. 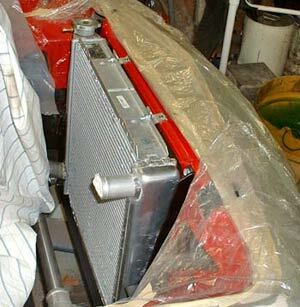 After several test-fits we found the radiator would have to sit nearly vertical in the opening. 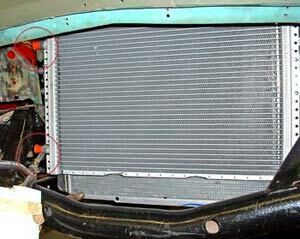 The radiator hangs vertically in the opening now suspended temporarily by tie-wraps. Time to make a bracket. 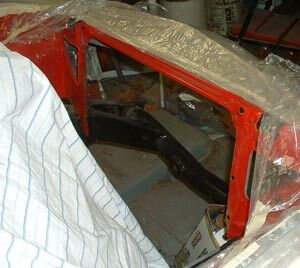 We could have modified the original Ford radiator bracket but deemed it quicker to fabricate our own out of angle iron. 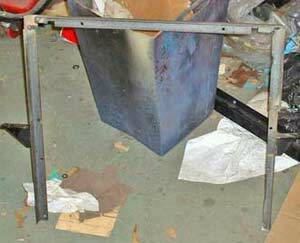 Many measurements and several welds later, we had a workable bracket that would hold the three components rigidly in place. 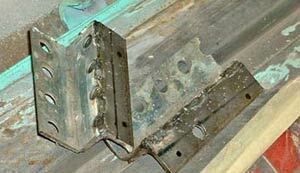 Once the complete bracket was ready we bolted it in place and proceeded to make fittings to mount the radiator. Three sides of the bracket are done, now for number four. It's in place, so onward to getting the problem sorted out. The radiator fits perfectly on the bracket, doesn't it? Sure enough, the radiator fit, but just barely cleared the steering rack at the bottom hose fitting. Now we had to mount the A/C condensor in front of the radiator, which necessitated manufacturing four stand-off brackets to hold it about 1/2 inch away from the radiator body. We were able to mount the condensor cleanly inside the nose area, leaving room for the refrigerant line connections. A little measuring, a little bending, a little welding, and the brackets are done! It's beginning to look functional now. 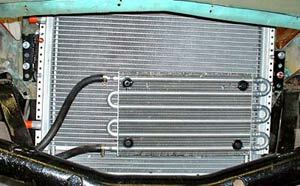 The transmission cooler presented a little problem. We thought at first about creating another set of brackets to mount it in front of the condensor, but after considering things a bit more we came up with another rationale. The cooler itself weighs just a few ounces and even filled with oil it's very light. Since the cooler came with vinyl, through-the-radiator, hold-downs and cushions, why not use them? The system will provide plenty of support, so our decision turned out to be effective. Everything is mounted and solid. We'll paint it black later. Finally, we reached the point where we could address the radiator hose connections and put some coolant in the engine. Since there are no pre-made hoses to accommodate our new modifications we bought a flex-hose for the top connection and a couple formed hoses of the right ID (made for other cars, naturally) to create our complex, curved bottom hose. Using the minimum number of connections we finally got a workable arrangement and then filled the cooling system to check for leaks. It's actually going to work and the system holds water! How Long Did All This Take? We made this project sound simple in the narrative because, in reality, each step was simple in its final form. What we couldn't show is all the changes in design and measurement problems we had along the way, nor could we properly explain how much time it takes to do each little task. Each misstep led us to the proper solution in the end, but there were plenty of wrong approaches to each challenge. This type of project is an exercise in patience. What you see here is a project that took nearly three solid working days from start to finish, including painting the brackets.